Following Christ is not always easy, but takes courage, patience, and love. In Ablaze: Stories of Daring Teen Saints, Colleen Swaim examines the lives of eight young men and women who were set fire with the Spirit and set free to live lives of extraordinary virtue. All became saints for the outgoing, against-the-current heroism of their teen years. Read how Chiara Luce, an Italian high school student, faced cancer joyfully, inspiring thousands to throng her funeral in song. Follow Kizito, a brand-new Christian, as his faith is challenged by a king and he is marched to his death for standing firm. From martyrdom to missionary life and from sickness to the silence of religious life, these teens show that we are all called to follow Christ in our own unique ways. These stories come alive with vivid storytelling and saintly challenges designed to inspire reflection and enflame your heart. Through prayers, images, and maps, catch a glimpse of a saint's world that carries lessons for our own--and discover how you can set our world ablaze with love for the Lord! Colleen Swaim is a teacher of religion and English in the Diocese of Covington, Kentucky, who encourages in young adults an understanding of the intense radicalism of sanctity and the dreary dullness of sin. 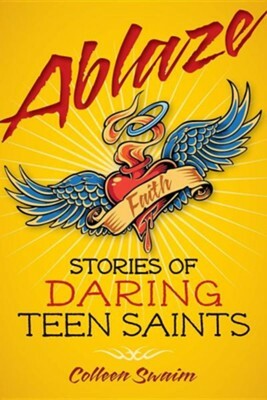 I'm the author/artist and I want to review Ablaze: Stories of Daring Teen Saints.